The Basics of Restoration… For Elementals! 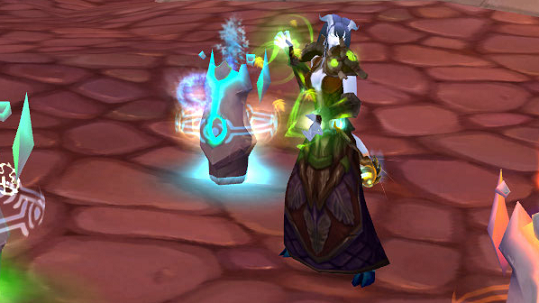 This week, we’re focusing on the restoration tree for the raiding elemental shaman’s. I know, that sounds like a bizarre contradiction but as shaman’s are a hybrid class, most will be asked to utilise the dual spec mechanism at some point. 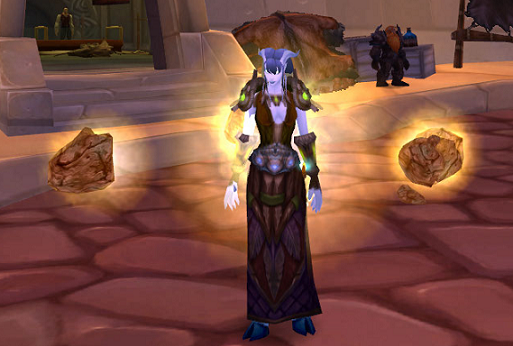 As main spec DPS, being ushered into a healing role can be pretty daunting and while a shaman has relatively few heals at our disposal, there is still a lot to learn about healing. 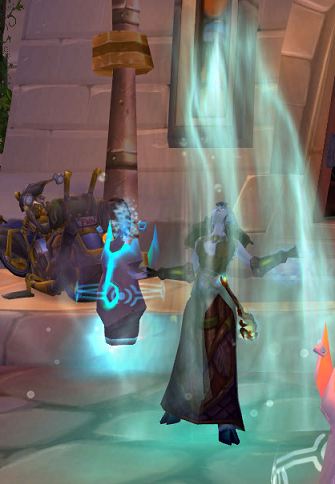 Understanding our restoration cooldowns, which spell to use when, how to glyph, which totems to use and how to configure your UI to make for effective healing is a learning curve. What follows below is the first in a series of articles looking at the restoration tree, starting with the most basic look at the actual spells we have at our disposal. Lesser Healing Wave is our fast casting, primary, single target heal. This is the spell you’ll be using to heal the tank (in both heroics and raids) and to top off any additional raid members taking high amounts of damage. This spell can and should be glyphed (though I’ll cover this in more depth in another section) and it will allow your Lesser Healing Wave to do 20% more damage if the target is protected by your Earth Shield (now you can see why it’s our tank healing spell). Healing Wave is our large but slow and expensive heal. You generally won’t find yourself using this a great deal as it’s simply too slow and too costly. It’s casting speed can be increased by using it during a Tidal Waves proc and it can be useful for moments when you need to land a large heal on a tank during a raid. In heroics, you won’t be using this spell. This spell becomes more viable with better gear (as higher haste levels will reduce the cast time to something more realistic). This spell is probably our best known. It’s our group heal and in situations where raid members are close enough to utilise the jumps, it’s a very effective raid healing method. This spell too can be glyphed to allow one additional “jump”. It should be noted that similar to the mechanic of our Chain Lightning spells, every “jump” the spell makes will reduce the effective output of the spell. In the case of Chain Heal, each jump reduces the effectiveness of the heal by 40%. You really only want to be using this spell if you have a guarantee of it jumping to additional targets. As a single target heal, it’s cast time is too long and it’s more mana intensive than a Lesser Healing Wave. 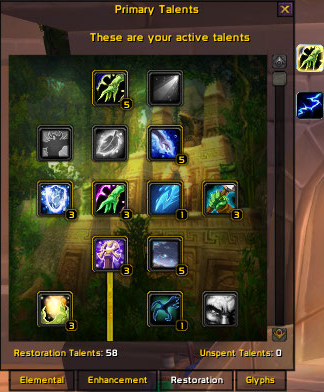 While the better restoration shaman’s will, ultimately, develop a good eye and a feel for when this spell is best utilised in a raid situation, there are addons for Grid that can help you to see how many people a Chain Heal could potentially hit (by highlighting who is in range of a target on your grid). Our 51 point Restoration talent and only instant heal or heal over time. Casting a Chain Heal on your Riptide target will cause the heal over time component to be removed and will increase the amount of the Chain Heal by 25%. While raid healing, casting this on, for example, a melee taking the highest amount of damage of the group followed by a Chain Heal will not only potentially save your Riptide target but then empower your Chain Heal and make for very efficient raid healing. It’s also very useful for topping off members of the raid that don’t quite justify a Lesser Healing Wave. Like Riptide, we gain this ability via talents and it’s the only one of our shields that can be placed on another target. Incoming damage will heal the target until the charges wear off. Regardless of your healing role within a raid, in most cases, you should be using Earth Shield on your main tank (and switching it should there be a tank rotation). If you’re main tank healing, while using Glyph of Lesser Healing Wave, your Lesser Healing Waves will heal for more on your tank target. There are occasions where using an Earth Shield on another person can be beneficial. As an example, when progressing through Ulduar hard modes, we would use the Earth Shield on our caster “tanking” Mimiron’s head during the firefighter achievement. In heroics, put it on your main tank and refresh whenever it’s needed. Grid can be modified to display who your Earth Shield is currently on (and the charges remaining). Totem Timers can also be set to display the same information. (I’ll do a seperate section entirely for UI modification for the purposes of healing). This is the Elemental Mastery of the restoration tree. When activated, your next healing will become an instant cast. This is an ideal cooldown for those moments when a tank is about to die. Utilised with a Healing Wave, you can land an instant and fairly heavy, heal. If you know there is a boss ability due that will really stretch the healing, then save your Nature’s Swiftness for this part of the fight. As a hint for those players, like myself, who primarily play as elemental, bind your Nature’s Swiftness to the same key that usually houses your Elemental Mastery. When you cast Chain Heal or Riptide, you have a 20% chance of lower the cast time of your Healing Wave spell by 30%, and increase the critical effect chance of your Lesser Healing Wave spell by 25%, until two such spells have been cast. In addition, your Healing Wave spell gains an additional 4% of your bonus healing effects and your Lesser Healing Wave gains an additional 2% of your bonus healing effects. Basically, every cast of Chain Heal or Riptide has the chance of triggering this effect. If you take the maximum rank of this ability (which you should) you have 100% chance to trigger Tidal Waves from your Riptides or Chain Heals. If Tidal Waves activates at a time where there is very heavy damage incoming, it can allow you to cast a couple of Healing Waves (our strongest heal but generally too slow and costly to be used often) to help stabilise the healing situation. If it activates under normal conditions, your Lesser Healing Wave has a higher chance to crit. Regardless, both spells will heal for more as they gain more from our bonus healing. Due to the chance of this skill triggering, Riptide should always be running, regardless of whether you’re raid healing or tank healing. Facilitate Chain Heal when there is raid wide damage and positioning is such to allow it to “jump”.